A recent speech by Hizballah chief Hassan Nasrallah contained unusually aggressive statements, calling for the ethnic cleansing of Jews from Israel, and claiming that a future war would lead to Israel's "demise." Nasrallah said Israeli Jews should "leave and return to the countries from which they came so they are not fuel for any war that the idiotic [Prime Minister Benjamin] Netanyahu government takes them to... They will have no secure place in occupied Palestine." The speech echoed rhetoric recently espoused by the Iranian regime and its military officials, who said Tel Aviv would be "destroyed" if Israel made "a mistake," and that Israel would not survive for more than 25 years. The first message is a reaffirmation of the Shi'ite axis's jihadist, ideological, long-term commitment to Israel's destruction. The second message is more immediate; it is an attempt to deter Israeli decision makers from trying to stop Iran and its proxies from taking over Syria. 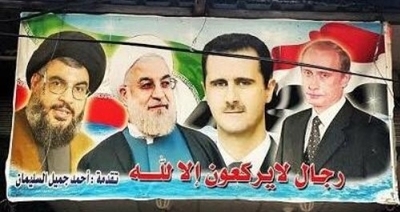 Iran, together with its chief agent Hizballah and several other Shi'ite militias, are helping the Assad regime complete its victory in Syria, with the assistance of Russian airpower. This is a victory made possible by the mass murder and terrorization of Syria's Sunni population, and the ensuing mass movement of refugees out of the country. The upsurge in war-like rhetoric towards Israel is a signal of growing Iranian-Hizballah confidence, fuelled by their victories in Syria. Radical Shi'ite forces – armed, funded, and commanded by Iran – are moving into the vacuum left behind by ISIS. Tehran's objective is to turn Syria into another Lebanon; a heavily armed outpost from which Iran can launch attacks against Israel. Despite the latest bluster, Nasrallah made sure to issue his statements from the safety of his Lebanese bunker – an indication he still fears Israel's powerful reach. Nasrallah and his Iranian masters have good reason to remain fearful of Israel, for it is the only state that has both the capability and determination to challenge their takeover of Syria. There have been a series of reported Israeli precision strikes on weapons production centers and arms smuggling attempts in Syria. One strike reportedly targeted the Assad regime's Scientific Studies and Research Center (CERS) weapons facility, where chemical, biological, and advanced ballistic missiles are developed and manufactured. The targeted facility may have been where Iran tried to hand over powerful weapons to Hizballah. Israel is running a low profile campaign against the dangerous buildup of Hizballah's weapons arsenal. These are arms that are produced in Iran and Syria, and trafficked to Lebanon. This Israeli campaign is a thorn in the side of the Shi'ite axis. There is a wider Israeli warning here: Jerusalem has no intention of sitting on the side and watching Syria turn into an Iranian-Hizballah base. Israeli leaders are issuing their own warnings, making it clear that provocations by the Shi'ite axis can lead to devastation. In addition, Israel has stated it will not tolerate an approach to its border by Iranian or Hizballah forces operating in Syria. Sunni states like Jordan and Saudi Arabia are equally disturbed by events in Syria. But Israel is the only regional state with the ability to stop the Iranian game plan. Only time will tell whether the world continues to turn a blind eye to the radical Shi'ite entrenchment in Syria, and leave Israel to deal with this mess by itself. Meanwhile, recent comments by the head of the Mossad, Israel's overseas intelligence service, serve as a timely reminder of the fact that the Iranian nuclear program remains a threat. The nuclear program is only temporarily dormant. "Iran continues to possess a vision of having a significant nuclear capability, leading to a military nuclear ability," said Mossad chief Yossi Cohen in recent days. "Iran continues to act with increasing aggression in activating military forces and operations in the Middle East, closer to our border than ever, in the Lebanese and Syrian arenas [which are] as one. Iran continues to support Hizballah, and recently, it is increasingly supporting Hamas. Iran continues to transfer advanced and precise weapons to terrorist organizations in our area," the Mossad chief said. The Mossad conducts "thousands of operations, some complex and daring, in the heart of enemy states," Cohen added. This not-so-cold war between Israel and the Iranian axis looks set to continue. Lines are being drawn in Syria by both sides. Israel's lines are purely defensive, while Iran and its agents are following a belligerent, encroaching agenda, which threaten to destabilize the entire region.